* What kind of insect does a back flip? * Which bug will wrestle with a rival? You'll find the answers to these and other fascinating questionsabout insects in Pet Bugs. 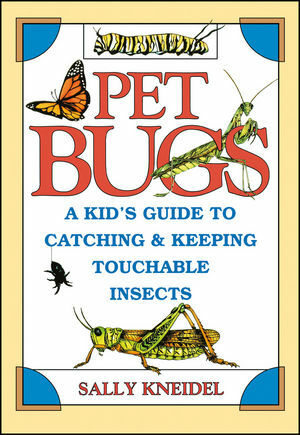 Small, easy to find, catch, and carefor, and intriguing to watch, bugs make terrific pets! In Pet Bugs,Sally Kneidel shows you how to catch and keep crickets, mantises,click beetles, and many more kinds of insects. She'll also give youa close-up view of how insects interact with one another and withtheir environment. C Captivating illustrations throughout the bookbring this fun-filled hobby to life for kids. SALLY KNEIDEL, Ph.D., teaches science to grades K-6 at Cotswold Elementary School in Charlotte, North Carolina. She is the author of Creepy Crawlies and the Scientific Method, and her articles have appeared in Mothering magazine, Ecology, and The Charlotte Observer. Bugs That Eat Other Bugs. Bugs That Have Special Tricks to Avoid Being Gobbled Up. Bugs That Look Like Something They're Not. Bugs That Live and Work in Groups. Bugs That Communicate with Each Other in Special Ways. Bugs That Multiply--Before Your Eyes!.